There was no fairytale ending to Leitrim's spring odyssey which had seen them secure promotion after a decade spent wandering in the football wilderness of Division 4. Derry, who played in Division 1 as recently as 2015, justified their favourites' tag by bagging their first trophy at headquarters since securing the Division 2 league title in 2013. There wasn't a hint of triumphalism in the victory speech of their captain Chrissy McKaigue though. Given the county's tradition, one suspects they are somewhat embarrassed to find themselves competing among the minnows. Bigger challenges lie ahead beginning with an Ulster championship clash against neighbours Tyrone in May, but according to manager Damian McErlean it was important to finish off the league campaign with an eighth straight win. 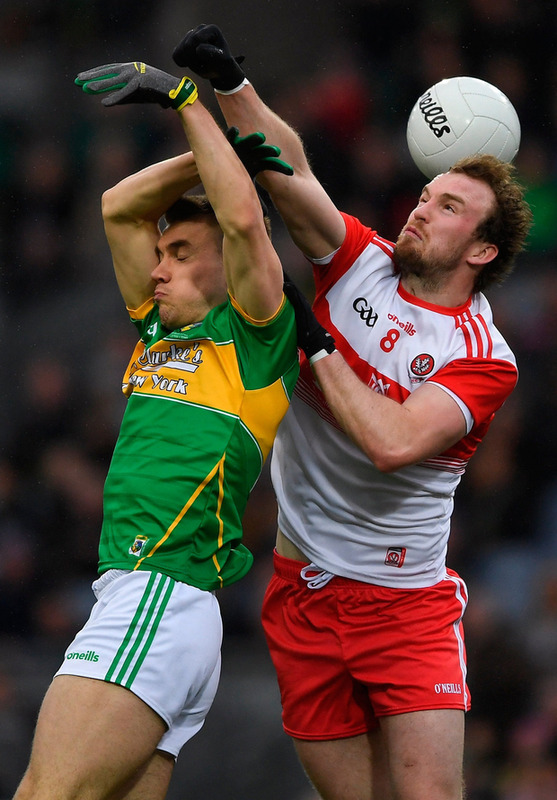 "We didn't want to come to Croke Park and falter at the last moment. We wanted to keep that momentum going and give the boys a bit of belief that they have won a trophy in Croke Park," McErlean said. "We expected a very tough challenge. We had looked at them and their forward line is very good and that came through today. They are a well-prepared side and really passionate about their county. The key thing for me, and we kept telling everybody, is that we are passionate about our county as well, no matter what anybody says. "Once we had a bit more patience we started taking control and probably the most pleasing part of the performance was that we settled our heads and started to control the game and kicked seven points in a row to go three up at half-time, and that was the key part of the game for us." Derry had one hand on the silverware at the break. Having played against a stiff breeze they led 0-10 to 0-7, though they were three points in appears (0-7 to 0-4) after a whirlwind Leitrim start. Though Leitrim settled early despite their unfamiliarity with the surroundings, their shooting then betrayed them as they kicked nine wides compared to three for Derry in the first half. The overall wides tally of 13-8, Leitrim the guiltier party, was the game's most revealing statistic. "Our biggest problem in the first half was the number of wides we kicked," acknowledged Leitrim boss Terry Hyland. "We were shooting a little bit on sight when we should have steadied the ship and made sure of the score. Perhaps that was a bit of inexperience and they will improve on that back of that. "I do think the wides ultimately killed us. Look at the ratio of wides on both sides, it is not hard to work it out. As I keep telling lads, we have statisticians and statistics but the biggest statistic is the scoreboard and if you don't keep that right you can forget about the rest of them." 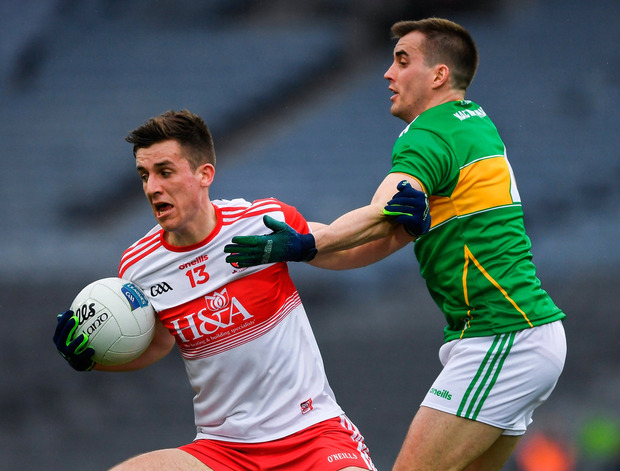 Once Derry exerted serious pressure on Chris McCrann's re-starts and began to turn over possession deep inside their own half - two of their second-quarter points came directly from Leitrim forwards being dispossessed - the underdogs struggled, conceding six points on the spin in the closing stages of the first half. Derry controlled most of the second half and they made telling use of the wind factor, landing an impressive collection of long-distance points, with man of the match Shane McGuigan leading the charge with a 0-6 tally. 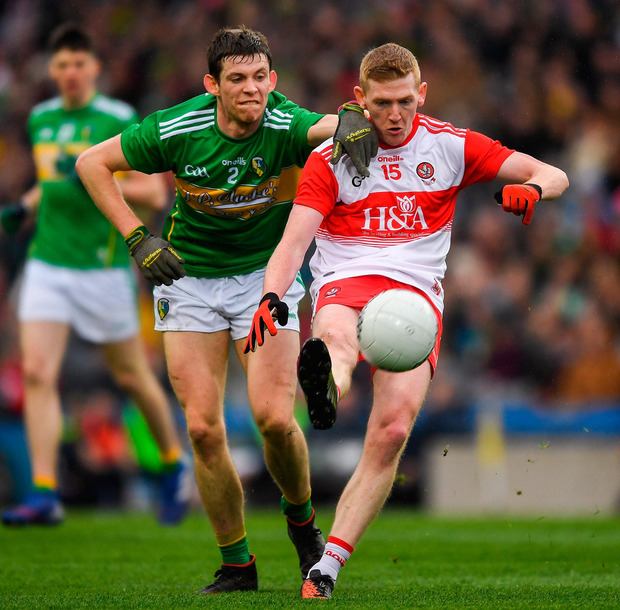 Leitrim did rally briefly in the dying minutes after bagging back-to-back points for the first time in the second half, and Derry full-back Brendan Rogers saved a certain goal with a last-ditch clearance. Overall, though, Leitrim could not complain about the final outcome. Their fans gave the team a standing ovation at the end but it was Derry captain Chrissy McKaigue who collected the silverware. Derry will be encouraged by their return of 0-17 from play the clean sheet they kept as they prepare for Tyrone in the championship. For Leitrim the rest of the year presents a different kind of challenge, beginning with a championship clash against Roscommon, but the main priority now for Terry Hyland is to try and keep this squad together as they face the mammoth task of keeping their place in a competitive Division 3 in 2020. Scorers - Derry: S McGuigan 0-6 (1f, 1m); R Bell 0-4 (1f); E Lynn 0-3; C McKaigue, E Bradley 0-2 each. P Cassidy, C Bradley (1f), N Toner 0-1 each. Leitrim: R O'Rourke 0-6 (4f); E Sweeney 0-2 (1f); M McWeeney, P Maguire, R Mulvey, M Plunkett, S Moran, D McGovern, D Flynn (1f), E Mulligan 0-1 each. Derry: T Mallon; K McKaigue, B Rogers, P McNeill; M McEvoy, C McKaigue, N Keenan; E Bradley, C McAtamney; P Cassidy, E Lynn, C Doherty; S McGuigan, R Bell, C Bradley. Subs: B Heron for Lynn (50), N Toner for Bell (50), J Rocks for Doherty (59), E McGill for K McKaigue (64), R Dougan for Bradley (70 +1). Leitrim: C McCrann; A Flynn, M McWeeney, P Maguire; R Mulvey, S McWeeney, C McGloin; M Plunkett, S Moran; S Quinn, R O'Rourke, D McGovern; D Flynn, E Mulligan, E Sweeney. Subs: P Dolan for McGloin (33), D Rooney for Mulligan (44), D Moran for S Moran (50), C Reynolds for A Flynn (61), J Heslin for D Flynn (65).